What to do when you've just graduated from college and your plans conflict with those of your parents? That is, when your plans to hang out on the couch, re-read your favorite children's books, and take old prescription tranquilizers, conflict with your parents plans that you, well, get a job? Without a fallback plan, Eshter Kohler decides she has no choice but to take the job her mother has lined up for her: babysitting for their neighbors, the Browns. It's a tricky job, though. Six months earlier, the Browns' youngest child died. Still, as Esther finds herself falling in love with their surviving daughter May, and distracted by a confusing romance with one of her friends, she doesn't notice quite how tricky the job is ... until she finds herself assuming the role of confidante to May's mother Amy, and partner in crime to Amy's husband Nate. Trapped in conflicting roles doomed to collide, Esther is forced to come up with a better idea of who she really is. 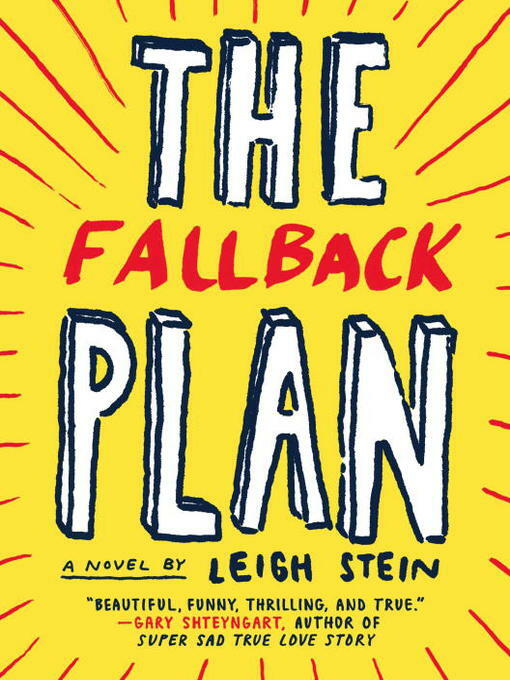 Both hilarious and heartbreaking, The Fallback Plan is a beautifully written and moving story of what we must leave behind, and what we manage to hold on to, as we navigate the treacherous terrain between youth and adulthood.